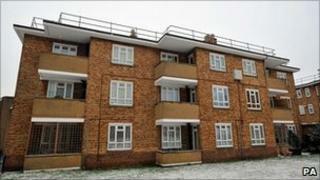 A four-year-old girl has been found dead at an address on an east London housing estate. The child's body was discovered at a property on Elderfield Road, Clapton, at about 1530 GMT on Thursday after reports of a knife incident. A woman, 36, believed to be the girl's mother, has been sectioned under the Mental Health Act after being arrested on suspicion of the girl's murder. No formal cause of death was given after the post-mortem examination. The girl was pronounced dead at the scene, an address on the Chatsworth Estate. Police said next of kin had been informed but formal identification had yet to take place. An inquest into the death is due to open at Poplar Coroner's Court on Monday. The Scotland Yard unit which deals with child abuse is leading the murder inquiry.